Click here for My Creative Time's April Release Blog Hop. Happy Easter! 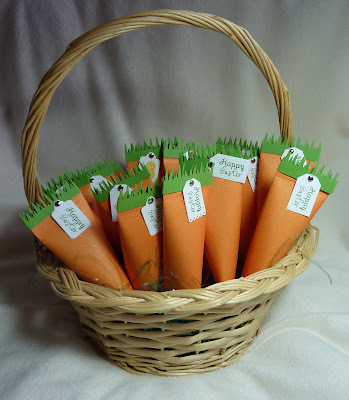 I just wanted to share the little "party favors" I made for tomorrow's Easter brunch. I love making sour cream containers, so I was excited to see them turned into carrots on Sarah's Pink Cricut blog. Isn't that a cute idea? Since I needed 19, I decided to keep mine pretty simple. 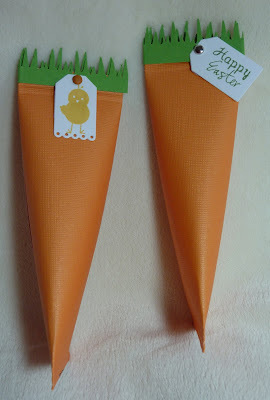 I made the ones for the kids with a chick stamp, and the adults' carrots are stamped with a sentiment from My Creative Time's "Color Me Happy" stamp set (there is different candy in each type). Hope you have a Happy Easter! Can you recommend a good link to show/explain how to make these containers? These are so cute! Your guests will love them. Such a cute idea. Happy Easter. Super Cute! Hope you had a great Easter! I too love the sour cream containers, made them for grandkids first day of school, now I have another twist on the design to add to my collection. I visit your blog EVERY day to get ideas for projects for school. I am very involved in my grandsons' school and have been elected the next PTA President. Glad they don't have an age limit. LOL! Love everything you do.